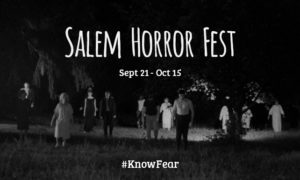 On Sunday, October 1, at 2pm, the Peabody Essex Museum, in partnership with the Salem Horror Fest, will host a screening of The Haunting, the 1963 film based on the Shirley Jackson novel The Haunting of Hill House. A panel discussion, produced in partnership with the Shirley Jackson Awards and Women in Film & Video-New England, will follow the screening. The program will include a music performance by New York’s Victorian goth-punk band The Long Losts. Jackson may be best known for “The Lottery,” one of the most widely read tales in modern fiction. Jackson was a prolific author and her several novels include We Have Always Lived in the Castle and The Haunting of Hill House. She also wrote two popular memoirs, four books for children, hundreds of short stories, as well as the non-fiction book for young readers, The Witchcraft of Salem Village. 2016 was a banner year for the Shirley Jackson revival. It was the hundredth anniversary of the author’s birth. A new collection of unpublished and uncollected works, Let Me Tell You, edited by two of her children, arrived in paperback in June. In addition, a major new biography, Shirley Jackson: A Rather Haunted Life, by literary scholar Ruth Franklin appeared in September and went on to win the National Book Critics Circle Award in biography and the 2017 Plutarch Award. A graphic novel version of “The Lottery,” beautifully illustrated by Jackson’s grandson Miles Hyman, came out in early October. A ballet, also based on “The Lottery,” continued to tour the country, and other film, stage, and television projects are in production. The Shirley Jackson Awards has a discount code for 50% off, use the code “SHIRLEYJACKSON” when checking out. A scientist, a skeptic, a psychic, and a lesbian question reality as they explore a large, eerie mansion with a lurid history of death and insanity in this 1963 horror classic. Jemma Byrne is a video editor working in the technology and higher education spaces. She works on a range of projects from short form documentaries, massive open online courses (MOOC), advertising, and business to business sales. When she’s not pretending to be a daywalker, she likes to prowl in the moonlight looking for food or sit in a dark room enjoying a movie (or five). As a long-time horror fan, she loves the thrill and creativity that exists throughout the genre but is also highly critical of the media she enjoys. She is a member of Women in Film & Video-New England. Shari DeBenedetti became interested in the paranormal field at a very young age as she experienced many strange and unexplained things. But it wasn’t until the age of 25 that she began to research and investigate the paranormal, because the house she lived in at the time was believed to be haunted. Shari and her family had many frightening experiences there. Shari wanted to help others who were experiencing paranormal activity so they would be comfortable living in their homes. When she’s not on the road filming Ghost Hunters, Shari enjoys spending time at home with her two children, Angelina and Nico. Shari also conducts private investigations with a few teams in her local area. Jack M. Haringa has served on the board of advisors and the jury for the Shirley Jackson Awards and is currently president of the organization’s board of directors. He founded the critical journal Dead Reckonings and has published short stories and essays in the horror and dark fantasy fields. He works at Worcester Academy, an independent day and boarding school in Worcester, Massachusetts, where he teaches English literature, including the stories and novels of Shirley Jackson. Paul Tremblay is the author of seven novels including Disappearance at Devil’s Rock, A Head Full of Ghosts (winner of the Bram Stoker Award and Massachusetts Book Award for best novel), The Little Sleep, and the forthcoming The Cabin at the End of the World. He is currently a member of the board of directors of the Shirley Jackson Awards, and his essays and short fiction have appeared in the Los Angeles Times and numerous “year’s best” anthologies. He has a master’s degree in mathematics and lives near Boston with his wife and two children. Over the last 20 years, the Peabody Essex Museum (PEM) has distinguished itself as one of the fastest-growing art museums in North America. Founded in 1799, it is also the country’s oldest continuously operating museum. At its heart is a mission to enrich and transform people’s lives by broadening their perspectives, attitudes and knowledge of themselves and the wider world. PEM celebrates outstanding artistic and cultural creativity through exhibitions, programming and special events that emphasize cross-cultural connections, integrate past and present and underscore the vital importance of creative expression. Women in Film & Video New England (WIFVNE) is a nonprofit membership organization dedicated to supporting the accomplishments of women working in the film, video and new media industries. WIFVNE works to promote proactive images of women to the public and to empower all women in film and video to achieve their professional potential. WIFVNE is a member of an umbrella group called Women in Film & Television International (WIFTI), a global network dedicated to advancing professional development and achievement for women working in all areas of film, video, and other screen-based media.